If you are a first time visitor to this page, i would like tell you one thing- " This post is gonna change your life forever".If you are not a first time visitor, please bear with my lie about the first statement. India went through elections this time and the country has given a second Chance to Manmohan Singh and co. Bush got a second chance too and we all know what he has done to the world. Hope Mr. Singh doesn't follow Bush's path. Is Singh the real king? We have to wait and see. How ever, down south; in a little continent SriLanka, the LTTE were not given a second chance and after 30 years of terror and bloodbath the Tamil Tigers were finally wiped out by the brave Srilankan Forces. Hope peace prevails there.Now your mood must be sad and disturbed. So let me take you to a lighter topic. I am gonna talk about sports. The man in this picture is Lance Armstrong. Now let me deviate totally to a National issue. If you are a part of any Indian Retail chain(Reliance, Spencers etc...) it is high time that you re-design your marketing efforts because Walmart has finally entered India. Walmart is opening its first store in Amristar [link]. Walmart has kicked each and every retail chain out of competition in all the countries they have stepped foot in. So if the Indian retail chains doesn't react soon and improve their Customer Relationship Management, they might never get a second chance to recoup. If you had read this post carefully, the point was basically on second chances. A second chance is given to people to change their course of action or to improve their performance. If you had been a regular reader of this page, you would have known that all the pictures on the left sidebar correspond to a certain topic. Chronicwriter has planned to include two new topics to this series. P.S: this one was not upto your usual stds! sure am waiting for the red underwear series!! ha he ho! cant imagine how that wud turn out..kalakura Chriz, puthu underwear, puthu bike...pramatham! and red underwear series..! am sure the blast wil begin.. Cheers Chriz... and keep writing! Hope Mr. Singh doesn't follow Bush's path. I seriously hope not! You never fail to make us laugh Chriz!!! uni-balls...lolz and looking forward to red underwear series. i cant wait enough for the cookery classes to start..
i will have a new way to torture vin...muhahahahahaha! Sing is King! I hope that the oppositions lets him rule properly this time. By the way, I have used som uni-ball pens, they are horrible. BUT, first tell me. Where do you get these photographs from? By the way, I'm waiting for the red underwear blog! Singh hopefully will be the King! Liked your humour and the blog is great, will come back for further reading as well as the backlog. well to me,this post gave me lot of information that i dint know. the golf pic was awesome buddy....where do u get these pics from? waiting for your red underwear series....! Chriz... atlast u decided to start RED chaddi series? And u gonna enlight ur readers with intricacies of cooking??? OMG!!! Have removed your blog from my reader, bookmark and every where else without leaving a trace...Every morning after reading it I never get a second chance at getting things done without laughing like a nut case. My neighbour is threatening to sue me. Hey you can borrow the 50 stars from my Laal Dupatta photograph to put up on your red underwear as long as you don't act up all kind and put up my name on the underwear as a dedication. Chef diaries??? ohh godd you are gonna make people hate the word food like you made us hate red chaddis??? Wonder whats the last pics all about! 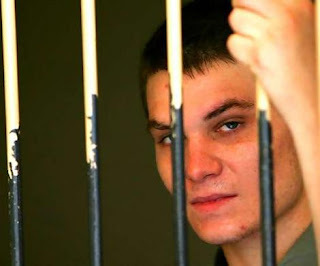 Is the guy in prison waiting for his second chance? 3. I am apprenhensive about your skills as a chef! What CAN you make?!!! well with respect to INDIA..i'd say Bush was better than OBAMA!! and abt Manmohan Singh ji..he's a gem of a person....a person who does his work honestly. and abt ur red undie craze..
having said all that...i would like to also echo you when you said...Not everyone deserves a second chance. oooo ! 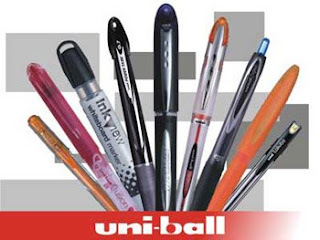 nice one .. haha .. i do like uniball pens .. i dont they need all that advertising .. ! looking fwd to the new category ... eeww gross ! gosh! the uni-ball concept rocks! n u dont like publicity, come again ??? Okay, one question. How do you get all important news, just curious coz people seem to have different strategies, and I just cannot seem to settle down into any. Do you just follow your RSS feeds/e-paper/other internet paraphernalia or is it plain old newspaper and TV and Radio? dude.. u cn get unlimited chances here.. ur fans are waiting everyday for posts on your blog!! quite different from the usual fare, and must say I agree with the last line. Some folks do not deserve a second chance, but isn't that decision subjective too?? why not give a second chance to food and not tamper with it ? plz? Ah, Chronic - writer getting a bit serious, eh? Anyway, yeah, totally agree, not everyone deserves a second chance. Period. And I wonder..do ppl really comment without reading the post?? Strange are the ways of life in blogosphere!! I am positive that Singh will not stop us from singing praises of India..(uh!..not really) bt.. I do hope he does deeds equivalent to a middle class man..if not a king!